There is just something so magical about listening and reading Christmas stories, and it’s one of our family’s most favorite Christmas traditions. It’s one of the most perfect ways to celebrate the season, and spend some really wonderful family time together. 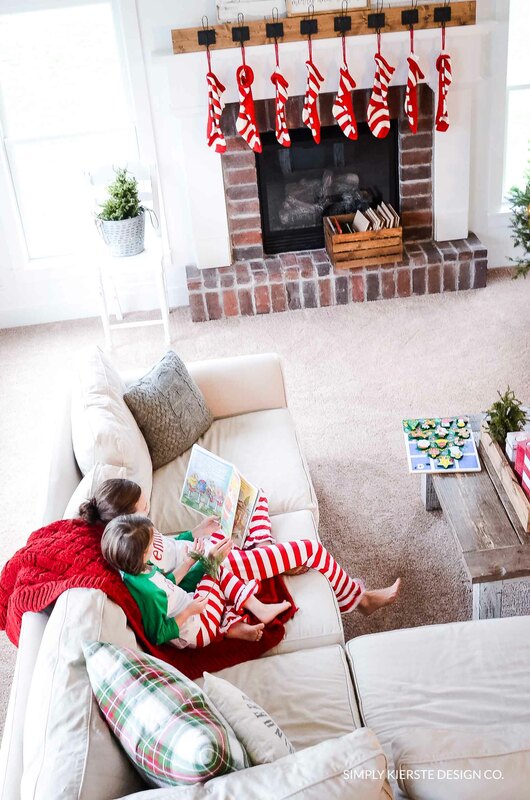 What could be more cozy than curling up on the couch each night, snuggling in blankets, and reading about the most beloved time of year? For all of those reasons, our Christmas Book Advent is one of the most beloved traditions of the holiday season. How does it work? 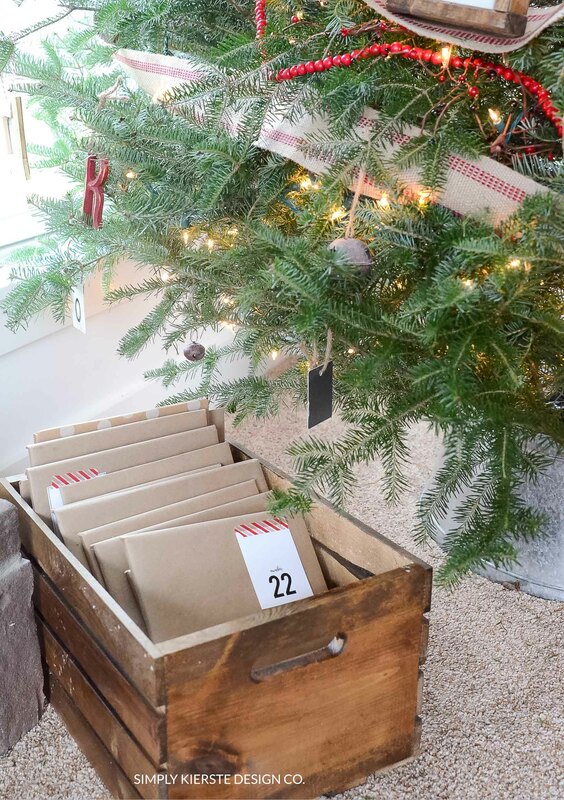 I wrap 25 Christmas books (my favorite way to wrap is with brown paper and red baker’s twine–love! ), and each day in December from the 1st through Christmas Day, my kids open a book for us to read together. Once they’re unwrapped, I leave them out so they can can continue to read and re-read them.I collect Christmas books, and every year I add to our collection and choose a few more favorites or new discoveries. I supplemented with books from the library for a long time until I had enough to do on our own, but I still like to grab a couple there. 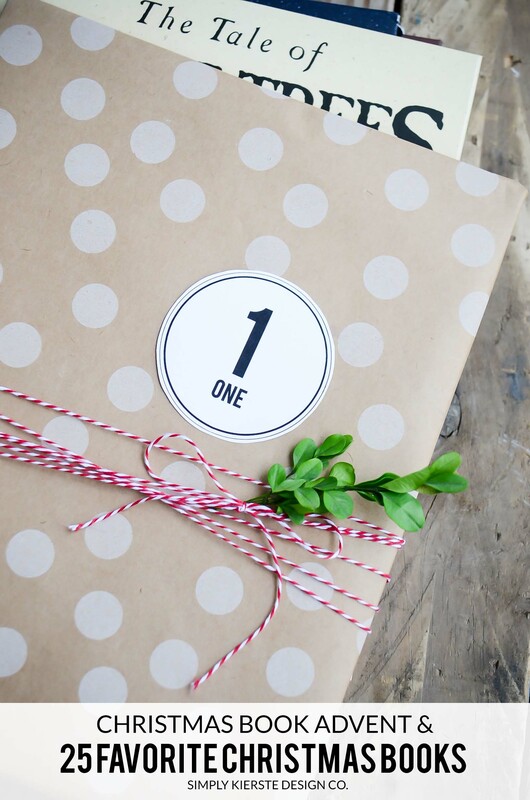 If you love the cute numbered tags, you can find them in my book, Simply Tradition...it also has tons of ideas for holidays all through the year! It’s never too early or too late to start your own collection! Just buy one or two favorites a year, or more if you can! Supplementing with library books is the way to go…just be sure to check with them to see how long you can have books out, and plan accordingly. Our library has always been a 30 day checkout, with no renewals for holiday books, so I checked my books out right around the 24th of November. Once we moved here, I found out that we only get a 2 week checkout period, so I have to change my plan. If you have children in school, make sure to check their Scholastic book orders–it’s a great place to get books at low prices. If you can’t buy books now, get all of them from the library, or even try garage sales or thrift shops where you might find a few treasures for cheap. I just received some new books in the mail for this December, and it literally made me giddy! I CANNOT wait to get started! My children are little, and I choose books accordingly, but I also challenge them a little bit, and select old-time classics and favorites that might be more than their typical listening level. These stories capture their attention, and they feel that extra something special that surrounds them, and they love to listen to even longer books than they might normally. I also include some board books, which my smallest ones love, and are appropriate for babies up to preschoolers. My school kids can be involved by reading these to their siblings, and they love that. I tend to shy away from character books, but if your children love those most, why not a add a few to your own library! For those of you with older children, or only adults in the home, try reading a chapter book aloud each night- like our family favorite, A Christmas Carol, by Charles Dickens. That’s something else we look forward to, and even the little ones listen in. I love when I find my kids reading these books all through the season after we’e opened them! Here is my list of favorite Christmas books…although it’s not all of them, because the list would be too long! But these are the ones we we love most and are a part of our Christmas Book Advent. I love this idea!!! We are big readers in our house, but books can be so expensive…any tips on how to do this without breaking the bank? Yes, they can be expensive! I actually budget money each year for Christmas books, and buy them throughout the year, rather than at Christmastime–when it all adds up so fast. If you have access to Scholastic book orders, it’s a great way to get books for less. They won’t always have all of your favorite titles, but they will offer a few. If you don’t have children in school, ask a friend–I’m sure they wouldn’t mind you adding onto their order. Do you ever get asked for gift ideas for yourself or kids? Tell them Christmas books!! You may even start a tradition with a grandparent, etc. Google the books you want, and look for the cheapest price–there can often be a difference that’s worth looking into. You might also want to try garage sales and thrift shops like Goodwill and Salvation Army–you might stumble onto a treasure! And again, while you’re collecting, the library is a perfect way to supplement and make up for the books you don’t have. I look on Amazon for used books. The shipping is usually around $4 per book, but I’ve always been able to find what I’m looking for for less than $2… Most of the time you can pick up children’s books for pennies! You can search according to condition as well, so you know you’re not getting a book that’s been colored in. My son and daughter in law has started this tradition with their 3 girls. She just goes to the Public Library and lets the girls pick out the books – then they come home and wrap them up and put them under the tree. Even though they picked the books out – they are still excited when they open each one. We love using the library for our Christmas books, and have for many years! 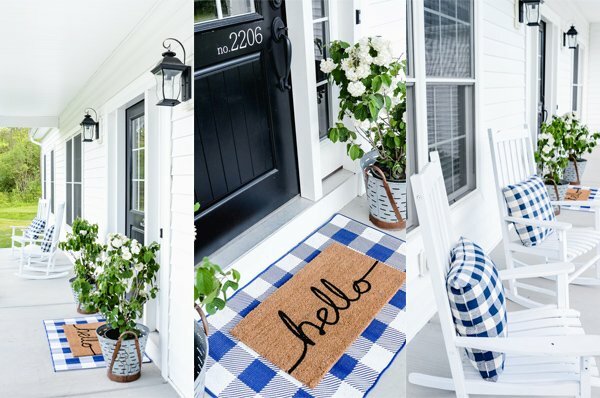 SUCH a cute idea — I love it! What a fun tradition, and what a great memory for your kids … not to mention a fabulous way to encourage reading! you know, another way to do this would be to borrow from the library if you don’t have money. maybe buy one book a year until you have a collection and borrow the rest from the library. 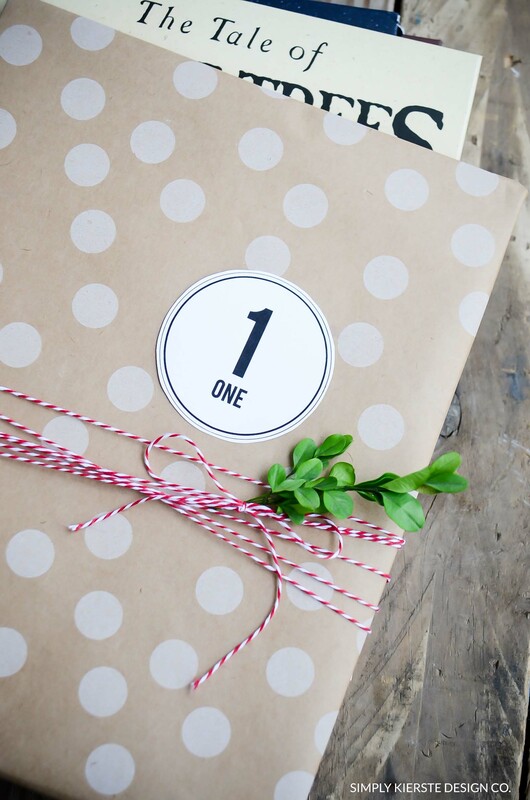 you would have to do it a little different but could still wrap them to make it special. Great idea kierste. there is a series of books by Arnold Ytreeide that are christian stories for advent. we read the first one, Jotham’s Journey to the kids last year and they loved it. Thank you SO MUCH for this list. Christmas stories are my very favorite tradition and I have so many favorites (many on your list!) I think I will be finding a few new favorites this year. This post has put me in the Christmas mood :) thanks! I love, love, love this idea. I’m a first grade teacher so I have the books just need the time to wrap them. I am doing it both at school and at home! I did the Halloween story countdown too…31 books in a basket and read one each night, my children LOVED it. I think I got it from you Kierste! at school it was a dream (22 school days=22 books) I never had to tell students how many days until Halloween, they just counted! Kierste, where can I buy the red and white bakers twine? I’m so glad you love it! Both the Halloween and Christmas countdowns are seriously my favorite traditions, celebrating one of my favorite things…books! How perfect to incorporate that into a classroom! I’m sure your students loved it. My favorite place to get the twine is from The Twinery (http://thetwinery.com/)–they have tons of colors, it’s nice & soft, and it’s pretty reasonably priced. You can also probably find it at a local scrapbook store, but they might be more limited on colors. Thank you for listing the books. I have read about the christmas book advent – and what a sweet tradition it would be to start – however I had no idea where to begin for books. I just printed out your list and hope to start collecting them through the month so we can start this on the 1st of December. Thank you! Also, I LOVE your blog…I have never commented before but your blog is bookmarked and one that I visit on a daily basis. Have you read Mortimer’s Christmas Manger? My new favorite! And an incredible family read aloud is: Jotham’s Journey. It is an advent story. Happy Holiday Season! I haven’t read those—I will definitely check them out, thank you!!! What a fabulous idea! I’ve never heard of this before, but we are big readers in this house, and I can’t wait to start this new tradition this year! 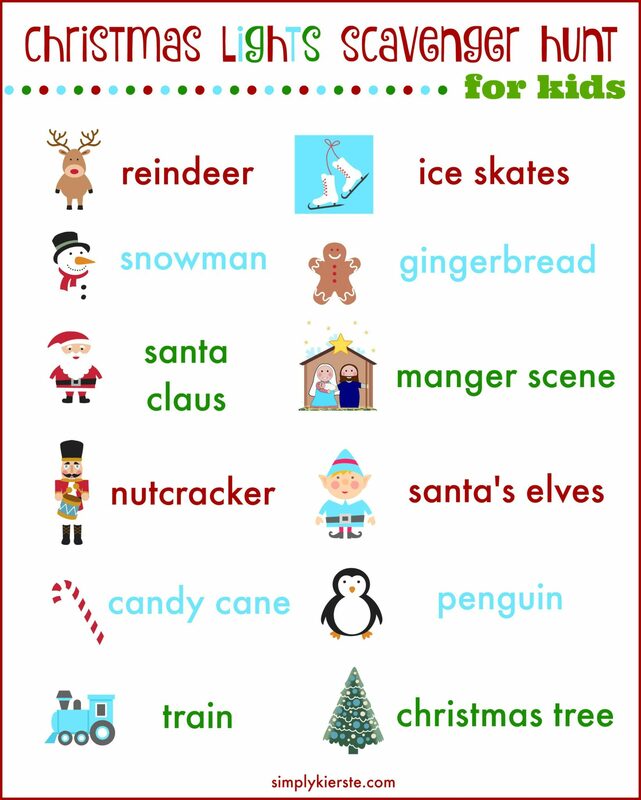 I love this idea so much I am going to do with my kids and with my preschool! Thanks! I have been looking around for Christmas Books, thanks for the suggestion. I buy one every year and I was led here! I really needed some more ideas, thanks! Miss you Kierste! First I love your blog, second I feel like this post was reading my mind. I got my daughter Scholastic book order & was trying to order a set x-mas books but do to lack of order the school could submit order. So I just happen to stumble on your blog post and it has so inspiring/ encouraged me not to give up on the idea. Thanks for sharing and great ideas. I hope the best for your family this holiday season. I did a blog post with 4 of my favorite Christmas books to read to my children and 2 are on your list! If I were to add more, I think I might borrow from many of the great ones you have here. Thanks for the post! A complimentary PDF of the Kindle edition of our book The Night Before Christmas… The Gift is available for review. May we send it to you? Since this is a Christmas title, we would not have time to get a print edition to you for review this year. Thanks for your list, Kierste. The Polar Express is one of our favorites. We also like Closing the Book on Santa Claus by Ron Chandler. It is about a father who tries to save his daughter’s holiday celebration after it is cancelled at the local school. He organizes a rally at city hall, but unexpected calamity prevails. My daughter made me read it to her twice. I haven’t read that one–thank you for the recommendation!!! I lovw The Best Chriastmas Pageant Ever (and she has another one about Halloween). Dickens wrote a lot of short Christmas stories; he wrote for a magazine; probably worth checking out, too! Wish I’d started this when my kids were little! Thank you for the heads up–I’ll definitely go check it out! So happy to see “The Year of the Perfect Christmas Tree” on your list! It’s not one that too many people are familiar with. I always get choked up with I read it. I agree with adding “Mortimer’s Christmas Manger” to your collection. Such a sweet story. A couple of other ones that we’ve loved for years are “Who is Coming to Our House.” and “The Clown of God.” Although my kids are teenagers, we still put out our basket of Christmas books. Santa’s Favorite Story is darling! You should read it. I love this idea! I love the idea of reading a chapter book with your family, too. I can’t believe I haven’t thought of that! We read individually with our kids but haven’t done a chapter book as a group. Also, maybe you’ve done a post on this and I need to look it up but I’d love a closer look at your stocking holder. I don’t want to put nails in my mantle so right now we have ceramic snowmen stocking holders that sit on our mantle, but I worry all season one of them is going to bite the dust. It’s pretty amazing they haven’t already actually! Does yours just sit on your mantle? Hi, Karen! Yes–reading a chapter book together is one of our favorite things, we love it. I didn’t post about my stocking holder, but it is a board I stained then added the hooks for the stockings. There are brackets attached to each end of the board, and they are nailed on the top of the mantel. I didn’t mind adding the nails because my mantel is really high, and no one can see on top of it. I didn’t want to add nail hols underneath or in front of the mantel, so this was my solution! 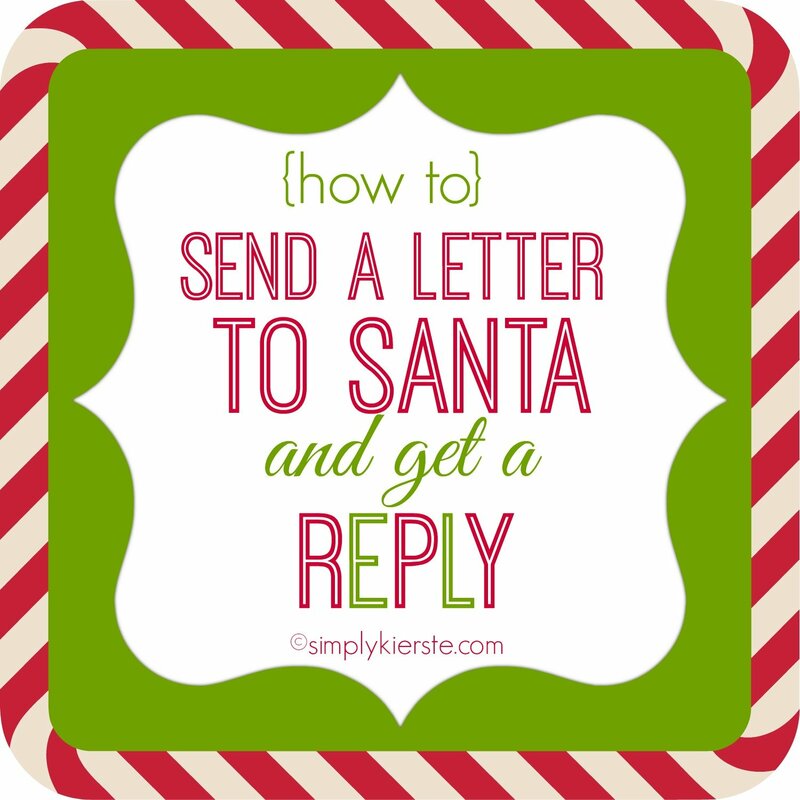 Oh Kierste, I just read your Christmas kindness countdown (Nov. 2018) and love that idea! Our 5 children now range in age from 30 down to 17, but when they were little we used to make Advent Prayer Chains. A similar idea to yours, but different. I would cut the strips of coloured paper, usually green and red or green and white. Then each child would write a name of a person to pray for on each strip of paper. Then we would staple the paper chain links together and hang it in their rooms. At bedtime they would tear off that day’s prayer chain and then we prayed for that person. When they got to the last chain, it was Christmas Eve. They were always so excited! After I read today’s post, I discovered your post from years ago (this post above) about the Christmas Book Advent, and so I am letting you know the Christmas books that were always treasures to us. ‘100 Shining Candles’, by Janet Lunn. The fictional family who lived in pioneer times has the same last name as our family name! ‘A certain small Shepherd’ by Rebecca Caudill. Very heartwarming and always makes me cry !! ‘Christmas in my Heart’ by Joe Wheeler…I think this was the first in that series and we were unable to find it in the stores to purchase. We would get it from the library every year and read through the many heartwarming short stories. My daughter managed to find it online last year, a used copy, and bought it for me! (for us!) ‘The 25 Days of Christmas’. Family readings, Scriptures and Activities fro the Advent Season, by Greg Johnson. This has daily short stories, scriptures and advent ideas.There is one book that I personally love to read close to Christmas. It is by Francine Rivers and titles ‘Unafraid’. It is a fictional account of the life of Mary the mother of Jesus. I love all of Francine Rivers’ books, but this one gives beautiful glimpses into what we call the Christmas story, the birth of Jesus. I highly recommend it. Thank you so much for your beautiful blog. I just discovered it a few months ago. You have a beautiful family and a beautiful looking home, which inspires me. Ours is a bit of a cluttered, overcrowded space that is always a work in progress (like me!). Your home is what my dream home could look like! :O) But for now the Lord helps me to (most of the time!) be content where we are, while dreaming of what someday might be. Blessings to you dear Mama of young ones. May God equip you to guard their hearts well and raise them up to live the love of Jesus in ordinary moments. Oh my goodness, thank you so much for this incredibly detailed and heartwarming message! This totally made my day, and in fact, your last words made me cry. Your kind words will not be forgotten. We’ve lived in a lot of different places–and one experience in particular taught me a lot about being content and happy wherever you are. Due to some pretty crazy experiences, we ended up in temporary housing for 2 years, with all of our things in storage. With six kids in a very small space, none of our belongings except for a few–it ended up being one of the best experiences for me and for our family. We quickly learned it’s not about where you live or what it looks like–but who is there with you.